In partnership with our preferred hotel partners, you can now enjoy terrific free extras every time you book a smartSTAY hotel with Corporate Traveller. Free and fast WiFi, late check-outs, a gym or spa experience. Different business travellers look for different value-adds when selecting a hotel. From a modern business woman to a tech savvy traveller or food fanatic, our experienced travel experts can offer you the best accommodation option to suit your travellers unique needs. We have partnered with the world’s largest hotel properties across the globe to ensure your accommodation offers value-adds like free breakfasts, complimentary gym access, room upgrades and more for your travellers at no extra cost! Browse through our range of over 3 000 hotels worldwide – you can see the selection properties in our smartSTAY brochure or simply download the smartSTAY app to see the full range. Our SmartSTAY programme, caters for six different types of business travellers, ensuring their benefits are matched and suited specifically to their accommodation needs. Fill in the form to get your brochure. Smarter benefits – receive specially negotiated discounts and complimentary services from our preferred hotels around the world. Smarter productivity – increase your comfort and convenience with value-adds designed specifically for business travellers. Smarter value – take the pressure off your travel budget by getting more for every rand you spend. 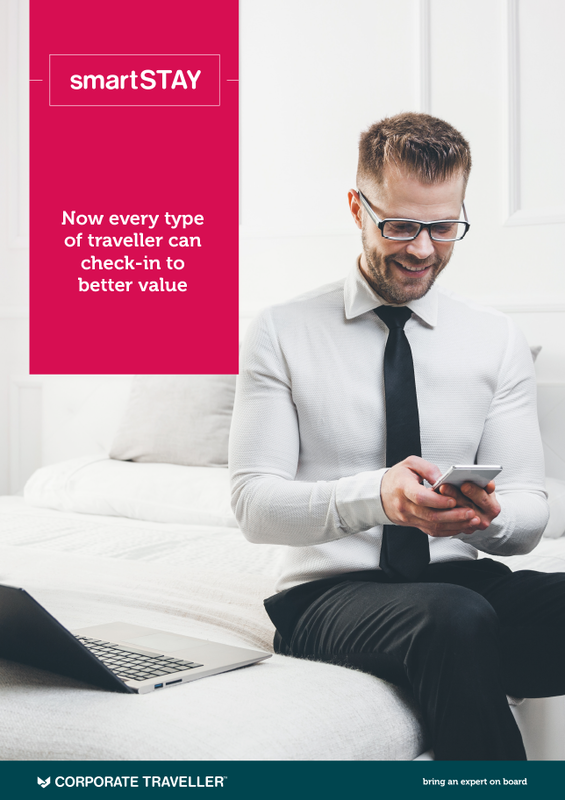 Check-in to better value with Corporate Traveller and SmartSTAY by downloading the SmartSTAY mobile app today! What information does the app include? The app provides an online directory of every participating hotel in our exclusive smartSTAY programme. The SmartSTAY app requires iOS 6.0 or later and is available for iPhone, iPad and iPod Touch. Alternative platforms require Android 2.1 or later.